150kg weight limit, 75kg weights, power rack, isolated bicep workout, upper pulley, lower pulley, leg extension, leg curl, butterfly, ergonomic backrest, more than 100 exercises available. The Home Gym inSPORTline ProfiGym C100 is a high-quality, multi-purpose home gym station that offers more than 100 different exercises that will help you effectively exercise your entire body. The steel structure with a frame profile of 50x100mm allows for a high weight limit and excellent stability. To strengthen your arms and back muscles, you can use the upper pulley. To exercise your legs, you can use the leg extension/leg curl, and to simulate rowing movements, you can exercise with the lower pulley. You may also appreciate the side rack with pulleys, which will help you strengthen your arms, especially biceps. 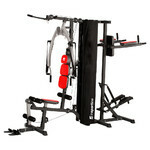 Moreover, the Home Gym inSPORTline ProfiGym C100 also has a grip to help you exercise an isolated bicep. Other advantages include soft padding, ergonomic backrest or anti-slip handles. The flexible steel cables allow for smooth and quiet running. The resistance is simply adjusted up to 75kg (15 x 5kg). All of the above makes the Home Gym inSPORTline ProfiGym C100 a popular and sought-after product not only for home use, but also for smaller fitness center or hotel gyms.